Bosnia has been inhabited since Neolithic times. In the late Bronze Age, the Neolithic population was replaced by more warlike Indo-European tribes known as the Illyrians. Celtic migrations in the 4th and 3rd century BCE displaced many Illyrian tribes from their former lands, but some Celtic and Illyrian tribes mixed. Concrete historical evidence for this period is scarce, but overall it appears that the region was populated by a number of different peoples speaking distinct languages. Christianity had already arrived in the region by the end of the 1st century, and numerous artifacts and objects from the time testify to this. Following events from the years 337 and 395 when the Empire split, Dalmatia and Pannonia were included in the Western Roman Empire. The region was conquered by the Ostrogoths in 455, and further exchanged hands between the Alans and Huns in the years to follow. By the 6th century, Emperor Justinian had re-conquered the area and large parts of the former Westerm Empire for the Eastern Roman Empire with its capital in Constantinople. The Slavs, a migratory people from southeastern Europe, were allied by the Eurasian Avars in the 6th century, and together they invaded the Eastern Roman Empire in the 6th and 7th centuries, settling in what is now Bosnia and Herzegovina and the surrounding lands. More South Slavs came in a second wave, and according to some scholars were invited by Emperor Heraclius to drive the Avars from Dalmatia on the coast of the Adriatic Sea. Around this time the Eastern Romans speaking Latin were evolving into what was called in later centuries as the Byzantine Empire, speaking the Greek (named for the ancient city of Byzantium, now the capital of Constantinople since the 330s, established by Emperor Constantine the Great). In addition to the Slavic-speaking population, a good number of romanized people remained in south Bosnia by the year 1000. Speaking an Eastern Romance language (related to Romanian), and having retreated into mountainous areas and adopted a pastoralist way of life, they became known as Vlachs. With time they assimilated, though maintaining specific customs, and the word Vlach came to indicate any shepherd. Being well-versed with horse breeding, Vlachs came to dominate trade and caravan from coastal merchant town towards the interior, growing prosperous and coming to dominate entire regions of Hum, thus merging in Bosnia's medieval feudal society. It is only from the 9th century that Frankish and Byzantine sources begin to mention early Slavic polities in the region. In this regard, the earliest widely acknowledged reference to Bosnia dates from the 10th century De Administrando Imperio written by Byzantine emperor Constantine Porphyrogenitus, during which period Bosnia is briefly a part of the short-lived Serbian state of Časlav, after whose death in battle in about 960, much of Bosnia finds itself briefly incorporated into the Croatian state of Krešimir II. Shortly thereafter, in 997, Samuel of Bulgaria marches through Bosnia and asserts his over-lordship in parts of it, however, only to be defeated by the Byzantine Empire in 1018 which annexes Bulgaria and asserts its suzerainty in Bosnia. 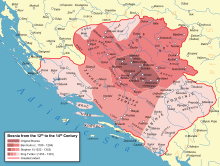 This lasted until later in the century when some parts of Bosnia are briefly incorporated into Croatia and others into Duklja from which the latter Bosnia appears to have seceded in about 1101, upon which Bosnia's bans tried to rule for themselves. However, they all too often found themselves in a tug-of-war between Hungary and the Byzantine Empire. In the year of 1137, Hungary annexes most of Bosnia, then briefly losing her in 1167 to the Byzantine Empire before regaining her in 1180. Thus, prior to 1180 and the reign of Ban Kulin parts of Bosnia were briefly found in Serb or Croat units, but neither neighbor had held the Bosnians long enough to acquire their loyalty or to impose any serious claim to Bosnia. The first recorded Ban (viceroy) was Ban Borić, vassal to the Hungarian king. However, he was deposed when he backed the loser in a succession crisis over the Hungarian throne. In 1167, Byzantium reconquered Bosnia and eventually emplaced their own vassal as Ban – the native Ban Kulin (r. 1180-1204). However, this vassalage was largely nominal, and Bosnia had for all practical purposes made itself into an independent state under Kulin. Ban Kulin presided over nearly three decades of peace and stability during which he strengthened the country's economy through treaties with Dubrovnik and Venice. His rule also marked the start of a controversy with the Bosnian Church, an indigenous Christian sect considered heretical by both the Roman Catholic and Eastern Orthodox churches. In response to Hungarian attempts to use church politics regarding the issue as a way to reclaim sovereignty over Bosnia, Kulin held a council of local church leaders to renounce the heresy in 1203. Despite this, Hungarian ambitions remained unchanged long after Kulin's death in 1204, waning only after an unsuccessful invasion in 1254, which also fostered the schism of the Bosnian Church. Bosnian history from then until the early 14th century was marked by the power struggle between the Šubić and Kotromanić families. This conflict came to an end in 1322, when Stjepan II Kotromanić became ban. By the time of his death in 1353, he had succeeded in annexing territories to the north and west, as well as Zahumlje and parts of Dalmatia. He was succeeded by his nephew Tvrtko who, following a prolonged struggle with nobility and inter-family strife, gained full control of the country in 1367. Under Tvrtko, Bosnia grew in both size and power, finally becoming an independent kingdom in 1377. Following his death in 1391 however, Bosnia fell into a long period of decline. The Ottoman Empire had already started its conquest of Europe and posed a major threat to the Balkans throughout the first half of the 15th century. Finally, after decades of political and social instability, Bosnia officially fell in 1463, while resistance was active and fierce for a few more centuries. Southern regions of Bosnia, nowadays known as "Herzegovina" would follow in 1483, with a Hungarian-backed reinstated "Bosnian Kingdom" being the last to succumb in 1527. The Emperor's Mosque is the first mosque to be built (1457) after the Ottoman conquest of Bosnia. The four centuries of Ottoman rule also had a drastic impact on Bosnia's population make-up, which changed several times as a result of the empire's conquests, frequent wars with European powers, migrations, and epidemics. A native Slavic-speaking Muslim community emerged and eventually became the largest ethno-religious group[note 1] (mainly as a result of a gradually rising number of conversions to Islam), while a significant number of Sephardi Jews arrived following their expulsion from Spain in the late 15th century. The Bosnian Christian communities also experienced major changes. The Bosnian Franciscans (and the Catholic population as a whole) were protected by official imperial decree, although on the ground these guarantees were often disregarded and their numbers dwindled. The Orthodox community in Bosnia, initially confined to Herzegovina and southeastern Bosnia, spread throughout the country during this period and went on to experience relative prosperity until the 19th century. Meanwhile, the native schismatic Bosnian Church disappeared altogether. By the late 17th century, however, the Ottoman Empire's military misfortunes caught up with the country, and the conclusion of the Great Turkish War with the Treaty of Karlowitz in 1699 once again made Bosnia the empire's westernmost province. But they allowed some of the Bosnian tribes to immigrate into the Arabian countries (Palestine, Jordan). The following hundred years were marked by further military failures, numerous revolts within Bosnia, and several outbursts of plague. According to an Ottoman Muslim account of the Austro-Russian–Turkish War (1735–39) translated into English by C. Fraser, Bosnian Muslim women fought in battle since they "acquired the courage of heroes" against the Austrian Germans at the siege of Osterwitch-atyk (Östroviç-i âtık) fortress. Bosnian Muslim women and men were among the casualties during the Battle of Osterwitchatyk. Bosnian Muslim women fought in the defense of the fortress of Būzin (Büzin). Women and men resisted the Austrians at the Chetin (Çetin) Fortress. 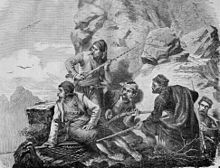 The women of the Bosnians were deemed to be militaristic according to non-Ottoman records of the war between the Ottomans and Austrians and they played a role in the Bosnian success in battle against the Austrian attackers. Yeni Pazar, Izvornik, Östroviç-i âtık, Çetin, Būzin, Gradişka, and Banaluka were struck by the Austrians. A French account described the bravery in battle of Bosnian Muslim women who fought in the war. The Porte's efforts at modernizing the Ottoman state were met with great hostility in Bosnia, where local aristocrats stood to lose much through the proposed reforms. This, combined with frustrations over political concessions to nascent Christian states in the east, culminated in a famous (albeit ultimately unsuccessful) revolt by Husein Gradaščević in 1831. Related rebellions would be extinguished by 1850. A renewed effort at Ottoman reforms occurred in the 1860s under the leadership of the governor Topal Şerif Osman occurred, as he founded a provincial printing press in 1866 that published in both Ottoman Turkish and Bosnian. Later, agrarian unrest eventually sparked the Herzegovinian rebellion, a widespread peasant uprising, in 1875. The conflict rapidly spread and came to involve several Balkan states and Great Powers, which eventually forced the Ottomans to cede administration of the country to Austria-Hungary through the Treaty of Berlin in 1878. While violent revolt prompted many to disparage Ottoman rule, it was in fact Ottoman reforms in the realm of cultural production and education that "created the conditions for greater intellectual production that continued during the Habsburg era." Coat of arms of Bosnia and Herzegovina during Habsbourg times. Though an Austria-Hungary military force quickly subjugated initial armed resistance upon take-over, tensions remained in certain parts of the country (particularly Herzegovina) and a mass emigration of predominantly Muslim dissidents occurred. However, a state of relative stability was reached soon enough and Austro-Hungarian authorities were able to embark on a number of social and administrative reforms which intended to make Bosnia and Herzegovina into a "model colony". With the aim of establishing the province as a stable political model that would help dissipate rising South Slav nationalism, Habsburg rule did much to codify laws, to introduce new political practices, and generally to provide for modernization. The Habsburgs took special care to integrate local Muslims into the fabric of empire, continuing, for example, to publish a provincial yearbook--much like the Ottomans--in Turkish for over a decade after the end of Ottoman rule. Many local officials moreover stayed the same, with the Mehmed-Beg Kapetanović Ljubušak, for example, remaining the mayor of Sarajevo under both polities and, moreover, obtaining the very same level of honor from both the Ottomans and the Habsburgs, with a Third Class Order of Mecidiye and a Order of the Iron Crown Third Class, respectively. All of this amounted to what one historian has called an "almost seamless transition from one empire to another." The idea of a unified South Slavic state (typically expected to be spearheaded by independent Serbia) became a popular political ideology in the region at this time, including in Bosnia and Herzegovina. The Austro-Hungarian government's decision to formally annex Bosnia-Herzegovina in 1908 (the Bosnian Crisis) added to a sense of urgency among these nationalists. The political tensions caused by all this culminated on 28 June 1914, when a Young Bosnia revolutionary named Gavrilo Princip assassinated the heir to the Austro-Hungarian throne, Archduke Franz Ferdinand, in Sarajevo. The event set off a chain of events that led to the outbreak of World War I. Although 10% of the Bosniak population died serving in the armies or being killed by the various warring states, Bosnia and Herzegovina itself managed to escape the conflict relatively unscathed. 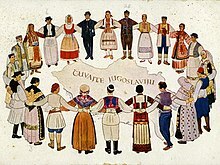 "Keep/Protect Yugoslavia" (Čuvajte Jugoslaviju), a variant of the alleged last words of King Alexander, in an illustration of Yugoslav peoples dancing the kolo. Following World War I, Bosnia was incorporated into the South Slav kingdom of Serbs, Croats and Slovenes (soon renamed Yugoslavia). Political life in Bosnia at this time was marked by two major trends: social and economic unrest over the Agrarian Reform of 1918–19 manifested through mass colonization and property confiscation; also formation of several political parties that frequently changed coalitions and alliances with parties in other Yugoslav regions. The dominant ideological conflict of the Yugoslav state, between Croatian regionalism and Serbian centralization, was approached differently by Bosnia's major ethnic groups and was dependent on the overall political atmosphere. Although the initial split of the country into 33 oblasts erased the presence of traditional geographic entities from the map, the efforts of Bosnian politicians such as Mehmed Spaho ensured that the six oblasts carved up from Bosnia and Herzegovina corresponded to the six sanjaks from Ottoman times and, thus, matched the country's traditional boundary as a whole. The establishment of the Kingdom of Yugoslavia in 1929, however, brought the redrawing of administrative regions into banates that purposely avoided all historical and ethnic lines, removing any trace of a Bosnian entity. Serbo-Croat tensions over the structuring of the Yugoslav state continued, with the concept of a separate Bosnian division receiving little or no consideration. The famous Cvetković-Maček agreement that created the Croatian banate in 1939 encouraged what was essentially a partition of Bosnia between Croatia and Serbia. However, outside political circumstances forced Yugoslav politicians to shift their attention to the rising threat posed by Adolf Hitler's Nazi Germany. Following a period that saw attempts at appeasement, the joining of the Tripartite Pact, and a coup d'état, Yugoslavia was finally invaded by Germany on 6 April 1941. Bosnia was the geographical mother of the partisan movement, providing ample space amongst its mountains for training and development. Once the kingdom of Yugoslavia was conquered by Nazi forces in World War II, all of Bosnia was ceded to the Independent State of Croatia (NDH). The NDH rule over Bosnia led to widespread persecution and genocide. The Jewish population was nearly exterminated. Hundreds of thousands of Serbs died either in Ustaše concentration camps or in widespread mass killings by Ustaše militia. Many Serbs themselves took up arms and joined the Chetniks, a Serb nationalist movement with the aim of establishing an ethnically homogeneous 'Greater Serbian' state. The Chetniks were responsible for widespread persecution and murder of non-Serbs and communist sympathizers, with the Muslim population of Bosnia, Herzegovina and Sandžak being a primary target. Once captured, Muslim villages were systematically massacred by the Chetniks. The total estimate of Muslims killed by Chetniks is between 80,000 and 100,000, most likely about 86,000 or 6.7 percent of their population (8.1 percent in Bosnia and Herzegovina alone). Several Bosnian Muslim paramilitary units joined the NDH forces to counter their own persecution in the hands of the Serbs in Bosnia. On 12 October 1941 a group of 108 notable Muslim citizens of Sarajevo signed the Resolution of Sarajevo Muslims by which they condemned the persecution of Serbs organized by Ustaše, made distinction between Muslims who participated in such persecutions and the wider Muslim population, presented information about the persecutions of Muslims by Serbs and requested security for all citizens of the country, regardless of their identity. According to the US Holocaust Museum, 320,000-340,000 ethnic Serbs were murdered. According to the Yad Vashem Holocaust Museum and Research Center, "More than 500,000 Serbs were murdered in horribly sadistic ways, 250,000 were expelled, and another 200,000 were forced to convert" during WWII in the Independent State of Croatia (modern day Croatia and Bosnia). Starting in 1941, Yugoslav communists under the leadership of Josip Broz Tito organized their own multi-ethnic resistance group, the Partisans, who fought against Axis, Ustaše, and Chetnik forces. They too, committed numerous atrocities, mainly against political opponents of all ethnicities. Some Bosnian Muslims joined the SS Handschar division, an SS division of the Nazis that pledged allegiance to both Adolf Hitler and NDH leader, Ante Pavelić. The division was the first SS division which was constituted of non-Germans. On 25 November 1943 the Anti-Fascist Council of National Liberation of Yugoslavia with Tito at its helm held a founding conference in Jajce where Bosnia and Herzegovina was reestablished as a republic within the Yugoslavian federation in its Ottoman borders. Military success eventually prompted the Allies to support the Partisans. On 6 April 1945 Sarajevo was captured by the Partisans. The end of the war resulted in the establishment of the Federal People's Republic of Yugoslavia, with the constitution of 1946 officially making Bosnia and Herzegovina one of six constituent republics in the new state. Because of its central geographic position within the for much of the 1950s and 1960s, the 1970s saw the ascension of a strong Bosnian political elite. While working within the communist system, politicians such as Džemal Bijedić, Branko Mikulić and Hamdija Pozderac reinforced and protected the sovereignty of Bosnia and Herzegovina  Their efforts proved key during the turbulent period following Tito's death in 1980, and are today considered some of the early steps towards Bosnian independence. However, the republic could not escape the increasingly nationalistic climate of the time unscathed. 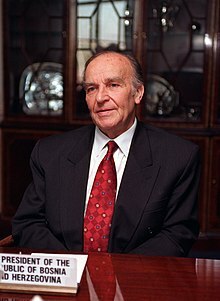 Alija Izetbegović during his visit to the United States in 1997. The first multi-party parliamentary elections held on 18 and 25 November 1990  led to a national assembly dominated by three ethnically-based parties, which had formed a loose coalition to oust the communists from power. Croatia and Slovenia's subsequent declarations of independence and the warfare that ensued placed Bosnia and Herzegovina and its three constituent peoples in an awkward position. A significant split soon developed on the issue of whether to stay with the Yugoslav federation (overwhelmingly favored among Serbs) or seek independence (overwhelmingly favored among Bosniaks and Croats). A declaration of sovereignty on 15 October 1991 was followed by a referendum for independence from Yugoslavia on 29 February and 1 March 1992. The referendum was boycotted by the great majority of Bosnian Serbs, so with a voter turnout of 64%, 98% of which voted in favor of the proposal. 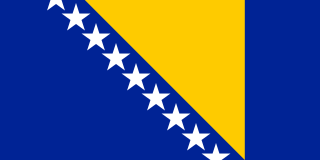 Bosnia and Herzegovina became an independent state on 3 March 1992. While the first casualty of the war is debated, significant Serbian offensives began in March 1992 in Eastern and Northern Bosnia. Following a tense period of escalating tensions the opening shots in the incipient Bosnian conflict were fired when Serb paramilitary forces attacked Bosniak villages around Čapljina on 7 March 1992 and around Bosanski Brod and Goražde on 15 March. These minor attacks were followed by much more serious Serb artillery attacks on Neum on 19 March and on Bosanski Brod on 24 March. The killing of a Bosniak civilian woman on 5 April 1992 by a sniper, while she was demonstrating in Sarajevo against the raising of barricades by Bosnian Serbs, is widely regarded as marking the start of warfare between the three major communities. Open warfare began in Sarajevo on 6 April. International recognition of Bosnia and Herzegovina meant that the Yugoslav People's Army (JNA) officially withdrew from the republic's territory, although their Bosnian Serb members merely joined the Army of Republika Srpska. Armed and equipped from JNA stockpiles in Bosnia, supported by volunteers, Republika Srpska's offensives in 1992 managed to place much of the country under its control. By 1993, when an armed conflict erupted between the Sarajevo government and the Croat statelet of Herzeg-Bosnia, about 70% of the country was controlled by the Serbs. Administrative division of modern Bosnia and Herzegovina. In March 1994, the signing of the Washington accords between the Bosniak and ethnic-Croatian leaders led to the creation of a joint Bosniak-Croat Federation of Bosnia and Herzegovina. This, along with international outrage at Serb war crimes and atrocities (most notably the Srebrenica massacre of as many as 8,000 Bosniak males in July 1995) helped turn the tide of war. The signing of the Dayton Agreement in Paris by the presidents of Bosnia and Herzegovina (Alija Izetbegović), Croatia (Franjo Tuđman), and Yugoslavia (Slobodan Milošević) brought a halt to the fighting, roughly establishing the basic structure of the present-day state. The three years of war and bloodshed had left between 90,000 and 110,000 people killed and more than 2 million displaced. Since its 1992 independence and the 1995 Constitutional framework of the Dayton Agreement, Bosnia and Herzegovina has followed a path of state-building, while remaining under final international supervision through the figure of the High Representative for Bosnia and Herzegovina. 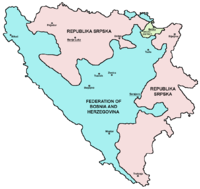 Bosnia and Herzegovina is a federation of two Entities - the Federation of Bosnia and Herzegovina and the Republika Srpska, as well as the district of Brčko. Each of the Entities has its own Constitution and extensive legislative powers. Bosnia and Herzegovina is a potential candidate country for accession into the EU; the EU-BiH Stabilization and Association Agreement (SAA) was signed in 2008 and entered into force in June 2015. Bosnia and Herzegovina submitted its formal application for EU membership on 15 February 2016; the EU Council conditioned its consideration to further progress on the implementation of the Reform Agenda, as well as to the adaptation of the SAA to take into account the EU accession of Croatia, and to an agreement on a functioning Coordination Mechanism on EU matters. These conditions were fulfilled by the Summer 2016. The accession of Bosnia and Herzegovina to NATO is in the negotiation phase, and a Membership Action Plan was signed in April 2010. It requires Bosnia and Herzegovina to define the issue of property over defence assets before NATO may consider the next steps. Bosnian political parties have different attitudes towards NATO: while Bosniak and Bosnian Croat parties support it, Bosnian Serb parties are more cautious and, while not opposing it in principle, require it to be put to a referendum first. On 4 February 2014, the protests against the government of the Federation of Bosnia and Herzegovina, one of the country's two entities, began in the northern town of Tuzla. Workers from several factories which were privatised and which have now gone bankrupt united to demand action over jobs, unpaid salaries and pensions. Soon protests spread to the rest of the Federation, with violent clashes reported in close to 20 towns, the biggest of which were Sarajevo, Zenica, Mostar, Bihać, Brčko and Tuzla. The Bosnian news media reported that hundreds of people had been injured during the protests, including dozens of police officers, with bursts of violence in Sarajevo, in the northern city of Tuzla, in Mostar in the south, and in Zenica in central Bosnia. The same level of unrest or activism did not occur in the Republika Srpska, but hundreds of people also gathered in support of protests in the town of Banja Luka against its separate government. The protests marked the largest outbreak of public anger over high unemployment and two decades of political inertia in the country since the end of the Bosnian War in 1995. ^ John Van Antwerp Fine (1994). The Late Medieval Balkans: Critical Survey from the Late Twelfth Century to the Ottoman Conquest. University of Michigan press. p. 44. ^ a b c d e f g h i Riedlmayer, Andras (1993). A Brief History of Bosnia-Herzegovina Archived 2006-06-18 at the Wayback Machine. The Bosnian Manuscript Ingathering Project. ^ Malcolm 1995, p. 71. ^ 'Umar (Būsnavī) (1830). History of the War in Bosnia During the Years 1737 - 1739. Oriental Translation-Fund. pp. 17–. ^ Oriental Translation Fund (1830). Publications. pp. 17–. ^ 'Umar (Būsnavī) (1830). History of the War in Bosnia During the Years 1737 - 1739. Oriental Translation-Fund. pp. 19–. ^ 'Umar (Būsnavī) (1830). History of the War in Bosnia During the Years 1737 - 1739. Oriental Translation-Fund. pp. 45–. ^ 'Umar (Būsnavī) (1830). History of the War in Bosnia During the Years 1737 - 1739. Oriental Translation-Fund. pp. 48–. ^ Michael Robert Hickok (1997). Ottoman Military Administration in Eighteenth-Century Bosnia. BRILL. pp. 15–. ISBN 90-04-10689-8. ^ Michael Robert Hickok (1995). Looking for the Doctor's Son: Ottoman Administration of 18th Century Bosnia. University of Michigan. p. 34. ^ a b c d e Amzi-Erdoğdular, Leyla (2017). "Alternative Muslim Modernities: Bosnian Intellectuals in the Ottoman and Habsburg Empire". Comparative Studies in Society and History. 59: 912–943. ^ Hoare, Marko Attila (2006). Genocide and Resistance in Hitler's Bosnia: The Partisans and the Chetniks 1941–1943. New York: Oxford University Press. p. 143. ISBN 978-0-19-726380-8. ^ Mojzes, Paul (2011). Balkan Genocides: Holocaust and Ethnic Cleansing in the Twentieth Century. Lanham, Maryland: Rowman & Littlefield. p. 98. ISBN 978-1442206632. ^ "Independent State of Croatia" (PDF). Yad Vashem Holocaust Museum and Research Center. ^ Federal Commission for Missing Persons; "Preliminary List of Missing and Killed in Srebrenica"; 2005 "". External link in |title= (help); Missing or empty |url= (help) (522 KB). ^ "Bosnia-Hercegovina protests break out in violence". bbc.co.uk. 8 February 2014. Retrieved 8 February 2014. Wikimedia Commons has media related to History of Bosnia and Herzegovina. Sandžak or Sanjak is a historical geo-political region divided by the border between Serbia and Montenegro. The name Sandžak derives from the Sanjak of Novi Pazar, a former Ottoman administrative district. Between 1878 and 1909 the region was placed under Austro-Hungarian occupation, following which it was ceded back to the Ottoman Empire. In 1912 the region was divided between the kingdoms of Montenegro and Serbia. Serbs refer to the northern part of the region by its medieval name Raška. The most populous city in the region is Novi Pazar in Serbia. The Islamic Ottoman Empire era of rule in the Bosnia and Herzegovina provinces lasted from 1463/1482 to 1878. Bosniaks are the fourth largest ethnic group in Serbia after Serbs, Hungarians and Roma, numbering 145,278 or 2.02% of the population according to the 2011 census. They are concentrated in south-western Serbia, and their cultural centre is Novi Pazar. Bosnian nationalism, Bosniak nationalism or Bosniandom is the nationalism that asserts the nationality of Bosniaks and promotes the cultural unity of the Bosniaks. It is often referred to as Bosniakdom. The Blessed Martyrs of Drina are the professed Sisters of the Congregation of the Daughters of Divine Charity, who lost their lives during World War II. Four were killed when they jumped out of a window in Goražde on 15 December 1941, reportedly to avoid being raped by Chetniks, and the last was killed by the Chetniks in Sjetlina the following week. The five nuns were later declared martyrs and beatified by Pope Benedict XVI on 24 September 2011. Bosnia and Herzegovina–Turkey relations describes mutual relations between Bosnia-Herzegovina and Turkey. Bosnia and Herzegovina is a southeast European country, while Turkey is an Asia Minor country with small European part on the Balkan peninsula around Istanbul. Diplomatic relations between the two countries started on 29 August 1992. Bosnia and Herzegovina has two embassies in Ankara and Izmir and one consulate in Istanbul, while Turkey has one embassy in Sarajevo and one consulate in Mostar. Ismet Popovac was a Bosnian Muslim lawyer and physician who led a Muslim Chetnik militia known as the Muslim People's Military Organization (MNVO) in Bosnia and Herzegovina during World War II. He was active in pre-war Yugoslav politics, becoming a member of the Serbian Muslim cultural organization Gajret and serving as the mayor of Konjic, a town in northern Herzegovina. He is also said to have been candidate for Vladko Maček's electoral list, but was left without a job in the Yugoslav state government after the creation of the Banovina of Croatia in August 1939.